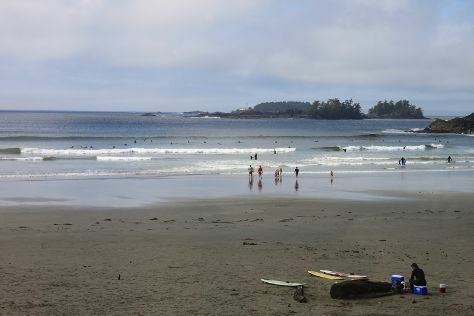 A tiny settlement on Vancouver Island's wild western coastline, surfers' favorite Tofino occupies a scenic location at the edge of Clayoquot Sound, a UNESCO Biosphere Reserve. Rolling waves make for outstanding surfing, but a holiday in Tofino also allows visitors to observe some of North America's biggest sea mammals. One of Canada's top eco-tourism destinations, Tofino provides an ideal base for nature lovers interested in wandering through the nearby old-growth forests, discovering tidal pools, and spotting eagles, bears, and river otters in their natural habitat. The town boasts a big selection of shops and eateries, providing alterative activities for visitors disinclined to spend their entire Tofino vacation outdoors. Tofino is in Clayoquot Sound. Make the most of your holiday in Tofino by finding out about its attractions and choosing what to see using our Canada online trip builder . Many options cluster around the township itself, in the island's north, with those near the beach or the town's marina usually proving the most popular. If the town feels too touristy, look farther south--you can find plenty of small hotels, guesthouses, and private holiday rentals along the coast, just off the Pacific Rim Highway. Make sure you reserve your accommodations in advance if planning to visit between June and September, the height of the season.